SUNY Cortland’s football team practices before Saturday’s game. 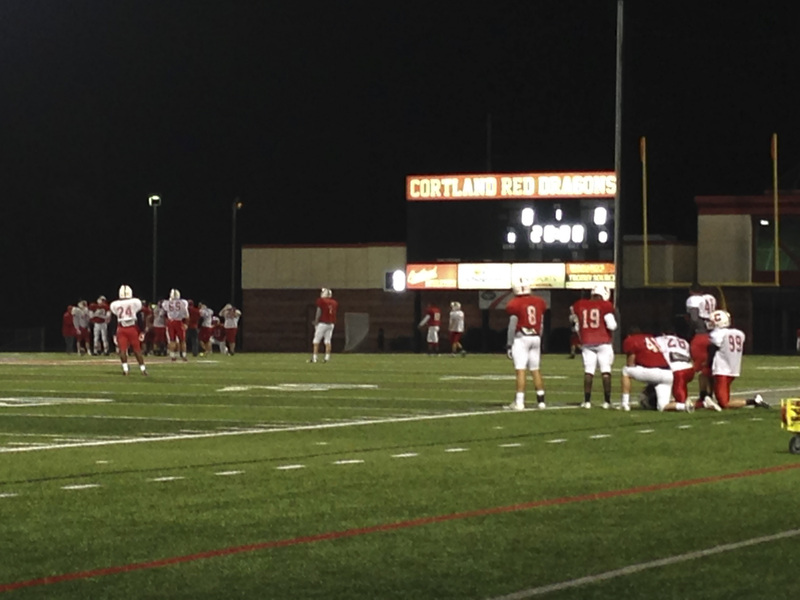 SUNY Cortland’s ‘Take Back Cortaca’ campaign, a part of the Cortaca Commission, will begin this week in an effort to prevent the mayhem that occurred during last year’s football contest between the Red Dragons and the Ithaca College Bombers. “We’re aiming at restoring Cortaca to what we feel it should be and discouraging a lot of the activity that lead to the problems last year,” Fred Pierce, SUNY Cortland public relations director and member of the Cortaca Commission’s Task Force, said. More than 30 people were arrested and charged with misdemeanors and felonies including driving while intoxicated and possession of marijuana after thousands of students stormed into the streets, flipping cars and jumping from windows during the 55th-annual Cortaca Jug game. The riots occurred on Nov. 16, 2013 in the city of Cortland, put the game’s future in jeopardy when community members called for the game to be cancelled. In the immediate aftermath of the riots, SUNY Cortland President Erik Bitterbaum and city of Cortland Mayor Brian Tobin created the Cortaca Commission. The 21-member team’s goal was to formulate a plan to prevent a similar situation in the future. Pierce said this year, Cortland officials will be monitoring Cortaca related content on social media. Social media posts contributed to last year’s extreme behavior and the increasingly rowdy behavior the partiers displayed, making the posts about the Cortaca celebrations go viral on the internet. Popular websites like Huffington Post and Buzzfeed posted articles about the Cortaca riots making the local event an international story. Since Nov. 2013, the Task Force has worked to control the parties that are expected at this year’s game by adding a city social host ordinance, increasing police presence and requesting officers from the New York State Liquor Authority to investigate underage sales within the Cortland area. SUNY Cortland could not release numbers on how many officers that are expected on game-day, but said several other law enforcement agencies will be assisting University and City Police. SUNY Cortland senior Kieran Barber said he’s seen more of a police presence in the city after the Cortaca riots, especially during Monroe Fest, a SUNY Cortland springtime party weekend. According to Pierce, however, the university understands they are not going to wipe drinking at Cortaca out completely. The commission thought it was important to provide alternatives for students to take part in. An open-mic night, Thursday Night Football viewing party, pep rally, pre-game carnival and dance concert following the game, featuring White Panda will be part of the week leading up to the Nov. 15 game. The concert will also be raffling off $20,000 worth of prizes, including iPads, GoPro cameras, MacBook Pros and gift cards. To win the prizes, however, students must be present at the event. Barber said students didn’t understand just how big the blow-up would be from their actions that day, reaching media outlets in France and New Zealand. Follow this link to view a timeline of events following Cortaca 2013.